These were relatively uncontroversial plans that passed through committee unanimously and onto consent at the full ANC. This is the sidewalk occupancy for The Eastern Wine Bar. It complies with all the regulations and the owner agreed to widen the clearance between the tree boxes and fence from the minimum six feet to eight feet. This application passed the committee unanimously and was placed on consent for the full ANC. This is a complicated application that I ran right into a Robert’s Rule cluster of motions and amendments. In the end, I voted in support of the motion to support the first floor fenestration changes and voted against the motion to take no position on the visible third floor. The building, an original one-story blacksmith shop from 1882, is currently being used as an office. The applicant presented evidence that the first-floor exterior is far from the original layout and the design is restorative in nature. A motion to support these first-floor changes passed 10-1-1 and I wholeheartedly support those changes. 1) This house is adjacent to a commercial area, next to some surface parking lots, and the rear of opposing houses. To quote the preservation regulations, “Pertinent considerations about the relationship of a project to a historic district include its compatibility with its immediate context and not merely its consistency with conditions found elsewhere in the historic district. “ (10A DCMR 2001(c)). The immediate context here is a one-off commercial building breaking up two identical rows of houses across the street from a surface parking lot and adjacent to the brutalist Rumsey Pool. Stepping back from the regulations, the adopted law says the intent of preservation is “To retain and enhance those properties which contribute to the character of the historic district and to encourage their adaptation for current use;“ and “To assure that alterations of existing structures are compatible with the character of the historic district” (DC Code 6-1101 2(a)). To that end, I will make (or support) a motion to support the third floor addition. The applicants in this case filled in a side yard and added a rear addition four or so years ago. They’ve returned to make changes to the areaway to add a basement entrance as well as redo the entry stairs to create a safe set of stairs and add a larger landing at the door. The committee voted unanimously to support this application. This Notice of Intent is to allow the new L’Enfant Plaza-Eastern Market Circulator to turn around without dead-heading to 4th Street. While this design looks good on paper, there is one fatal flaw and I will support any ANC resolution to oppose this change. Buses are at their most dangerous when they’re turning. And while this change will reduce the number of left turns by one, it does this by remove two signalized left turns into one unsignalized, unprotected left turn right next to a metro station and a heavily trafficked cross walk. There is no way I will support a design that adds an unprotected left to a bus route. Now, technically, this NOI is only for the road changes. I’m fairly agnostic on those. I find the discussion about relieving congestion on 8th street to be a classic failure of DDOT’s engineers looking at level of service for people driving cars, not people walking or cycling. In many ways, a heavily congested 8th street is a feature. I don’t want cars to be able to quickly get to speed with so many pedestrians and cyclists using the street. But, that being said, I’m not sure changing the 700 block of D Street will have that much of an impact on either 8th street congestion or adding cars to the neighborhood. The committee took no position on this and will have DDOT back next month to continue this discussion. This entry was posted in Uncategorized on March 12, 2019 by corey. As expected, it took me one meeting to fall behind on logging my votes. Anyway, February’s ANC 6B meeting was relatively light. Here are the votes. Captiol Hill Classic: Due to my misunderstanding, the organizers of the Capitol Hill Classic were not invited to the Planning and Zoning Committee meeting. As a neighborhood staple, this vote was relatively perfunctory as nothing changed from last year. The ANC unanimously voted to send a letter to DC HSEMA in support of the planned event routing. 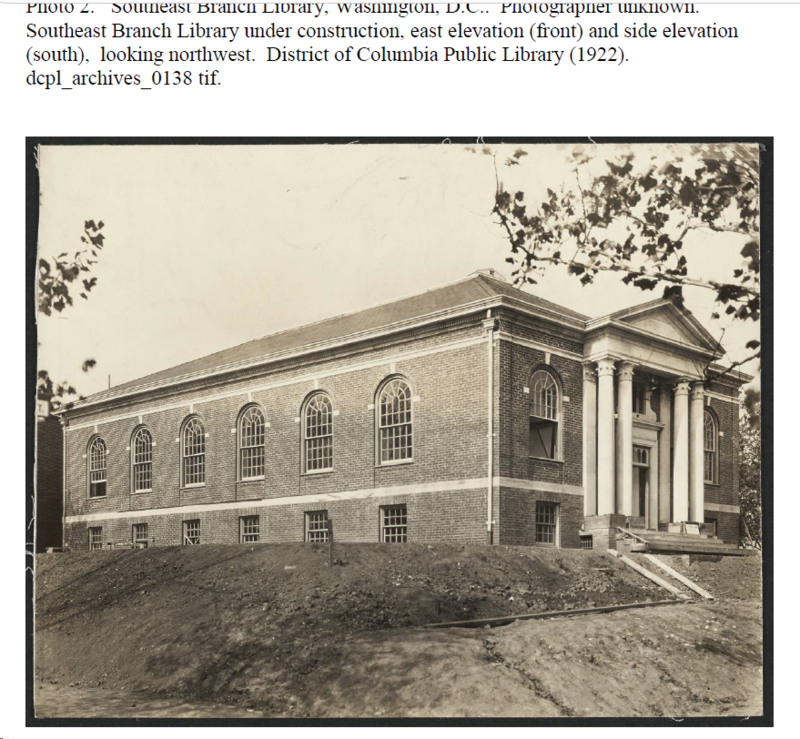 Southeast Library: My feelings are expressed in the committee report but this is a pretty straightforward application, given existing preservation law. The ANC unanimously voted (with three abstentions) to send a letter in support of this application to HPRB. Office of Zoning Oversight: I will put up a longer post on my testimony, but I voted for and the ANC supported this testimony. Office of Planning Oversight: Commissioner Sroufe put forward some testimony regarding HPRB’s treatement of non-contributing buidlings in historic distrcits. I agree with him that HPO’s treatment of non-contrbuting buildings is somewhat inconsistent with preservation law. It’s a gray area that needs more legislation or regulations though I think we disagree on preferred outcome (the lax guidelines employed I think are the right option, but clearly not in line with the law as written). I voted to support this testimony but the full ANC opposed it; Commissioner Sroufe will testify as an individual commissioner in lieu of officially representing ANC 6B. This entry was posted in Uncategorized on February 25, 2019 by corey. On Friday, February 15, I testified in front of Mary Cheh’s Transportation and the Environment committee on the performance of the Department of Public Works. As a resident of DC, I believe effective parking enforcement is critical for two reasons. One, many parking violations are a direct threat to the safety of pedestrians and cyclists. Oftentimes, like parking in a crosswalk or bike lane, the threat is observable and direct. But often times, especially in our commercial zones, lax enforcement leads to commercial delivery trucks using adjacent bikes lanes or general travel lanes to make deliveries. In these cases, it’s hard to fault the truck drivers when the dedicate commercial space is taken for non-commercial uses. Second, we live in a relatively dense environment and there’s a unwritten compact we all enter when we move in to be good neighbors. Often times, bad actors take advantage of this compact and lax parking enforcement doesn’t help. All day nonresident parking, parking in alleys, parking in crosswalks, parking too close to corners, failing to register your car in DC, and so many other things violate this compact and it’s up to DPW to enforce them. My name is Corey Holman, ANC commissioner for SMD 6B06. I am here today presenting my own views and not presenting the views of ANC 6B or any other commissioner in 6B. Before delving into criticism, I was to highlight one positive aspect of the work of DPW. Fort Totten Transfer Station. The employees are a treasure to the city and should be praised for their work. To make the city dump a clean, easy, and safe environment is not an easy task and they manage to do it. 4. Most importantly, DPW’s abdication of parking enforcement is dangerous and antithetical to Vision Zero. 1: DPW Simply isn’t issuing enough tickets. OCTO has made nine calendar years of parking ticket data available publicly. That dataset commingles DDOT and MPD parking tickets. Throughout this testimony, I will refer to parking tickets per workday, which removes the days where many tickets are issued by MPD and DDOT. I recognize these numbers will not match DPW’s provided numbers, but I can almost assure you the trends and percentages are about right. And if DPW and OCTO want to update their historical datasets, I wouldn’t complain. Fiscal Year 2018 saw the fewest tickets issued of any fiscal year with data available. 4,934 tickets issued per workday, 17% fewer than any other fiscal year. And before you think this is an aberration, things aren’t better in FY19. The first quarter in FY19 was saw the fewest tickets issued per workday of any available quarter, even though that month included the Vision Zero ticket blitz. The first chart I included on page 3 shows monthly tickets per workday with a 12-month moving average to remove some of the cyclicality. 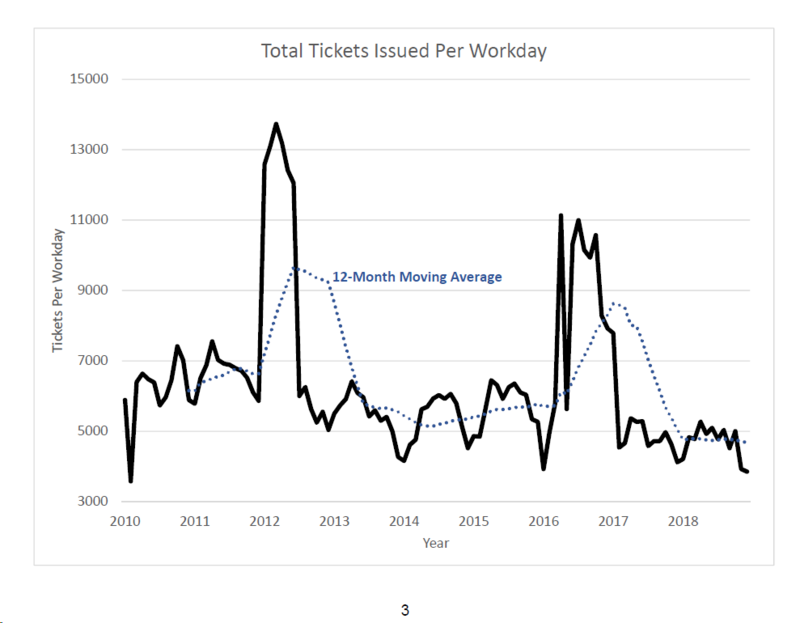 The moving average shows that in the last 12 months, DPW has issued fewer tickets that any 12-month period with data available. I want you to look at that chart if you can. What is going on here? 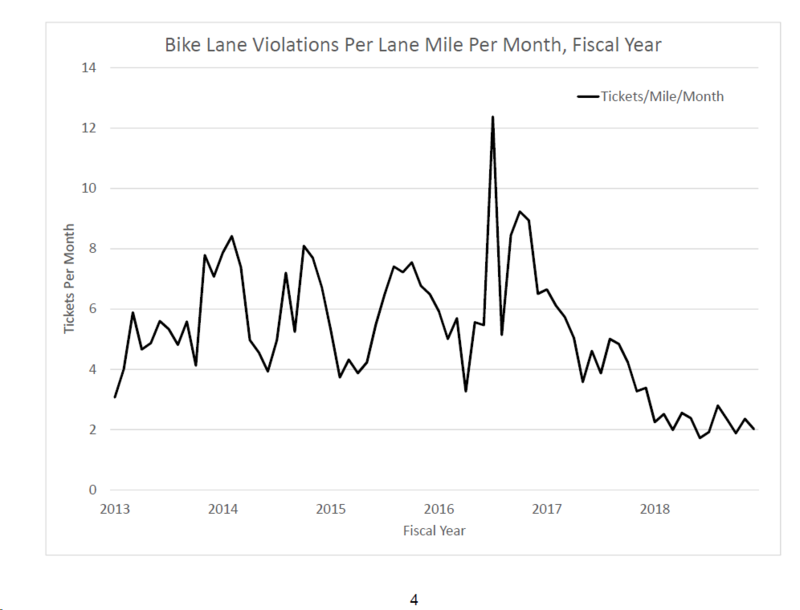 In FY 2018, DPW was issuing about 2 tickets per bike lane mile per month. Two per mile per month. Let that sink in. In FY 2018, that translates to 2,188. Sure, that sounds like a lot. But that translates into two tickets per bike lane mile per month of workdays. This data is on the second chart on page 4. Chairperson, when I put this testimony together, I paused here for multiple days. You bike. You’ve seen what it’s like. Multiply your bike commutes over a month. Do you only see two cars per lane mile per month during the workweek? 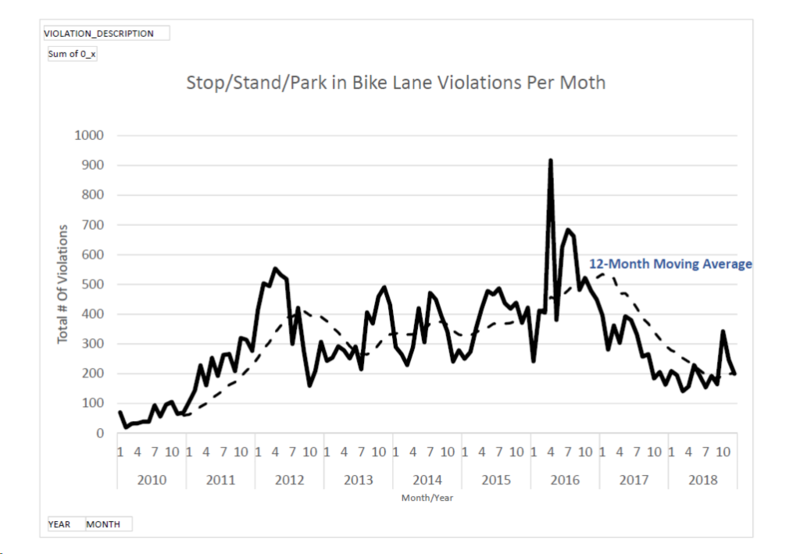 And the not-so-shocking thing is, in chart three when you stop looking at per mile numbers, the total number of bike lane violations is down, despite adding over 35 miles of bike lanes from the beginning of the chart to the end. How does this work? That’s chart 3/page 5. Ok, I presented a lot of data but indulge me for one anecdote. On February 4 I reported to 311 and tweeted at DPW at 8:21 AM of a car in a crosswalk at Kentucky Ave and Barney Circle. That car had $1100 in outstanding tickets and they were old enough for immobilization or impounding. At 12:37 PM, the car was still there. At 1:16 PM, I received notice that my 311 request closed with no violation found. At 5:26 PM, naturally, the car was still there. At 8:43 on the way home from an ANC Planning and Zoning Committee meeting, the car was still there. At 9:42, MPD Commander Morgan Kane of the First District copied me on an email tell Johnny Gaither of DPW the car was still in the crosswalk. Dan Ridge, a neighbor and former ANC Commissioner, noticed the car in the crosswalk around midnight. Can you imagine receiving an email from a District Commander and ignoring it? Well DPW can. The next morning, this car was not in the crosswalk so yay. But it was simply moved forward out of the crosswalk (by whom I don’t know). I put in another 311 request and the car was impounded that day. Not for blocking the sidewalk but for outstanding tickets and expired out-of-state registration. How does a car spend the entire day in a crosswalk, even after being reported through 311? How? Believe it or not, I don’t want to do this! But there are countless other violations I’ve reported to DPW, with the state and license plate to show the car is eligible for boot/tow. In those cases, why doesn’t DPW send a tow truck or boot team straight there, rather than a general enforcement person who then has to request the tow. How can I, a private citizen, be able to better leverage technology like How’s My Driving DC to determine boot and tow eligible vehicles better than DPW dispatch? It’s just preposterous. Why am I entering license plate information into 311 requests if that information isn’t cross referenced against a list of boot/tow eligible vehicles to determine who to send out? And one more suggestion to improve boot and tow operations. Why isn’t there a booter with ROSA enforcement? In the last week, I’ve requested enforcement three times and tickets were issued overnight. Great, that seems to be working. But two of those three times the car was eligible for booting or towing. I would implore you to ask Director Geldart if booters are included in ROSA enforcement and, if not, why not? Not let’s thread data and anecdote. While it’s easy to brush off my testimony as someone screaming into the wind about rules or revenue, it’s not. Parking enforcement should be a core part of Vision Zero. 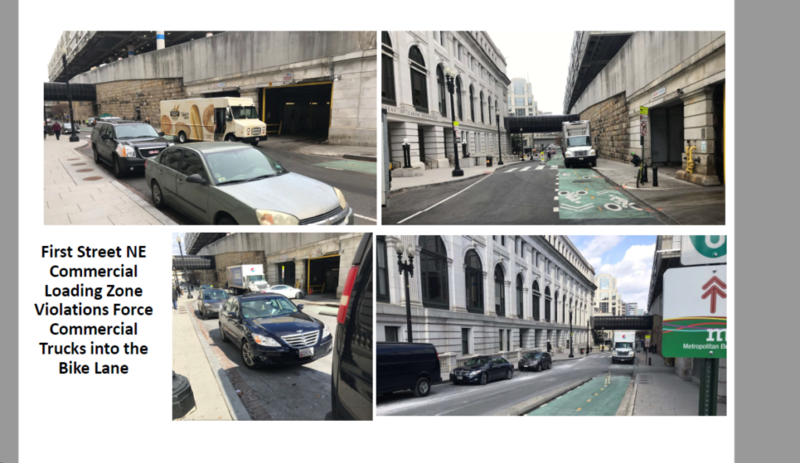 I’ve attached four pictures on page 6 of cars parked in the 600 block of 1st street NE commercial loading zone all from different days forcing commercial trucks to park in the bike lane. Starting in 2016, four months after the protected bike lane was installed, only one ticket is issued every 2.8 workdays. Do you know what this means? A never-ending parade of commercial vehicles parked on the sidewalk and in the protected bike lane because DPW can’t be bothered to enforce the commercial loading zone. Time after time, cyclists and scooterists are forced into the general travel or onto the sidewalk violators go unpunished. This data is in chart 4/page 7. Before finishing, I want to point out this testimony along with pictures, charts, Excel workbook and python source code for pulling the data is available on my website, coreyholman.com, and I can provide the code and data to the committee or DPW if requested. ANC 6B is putting together a list of needed bike racks by SMD. 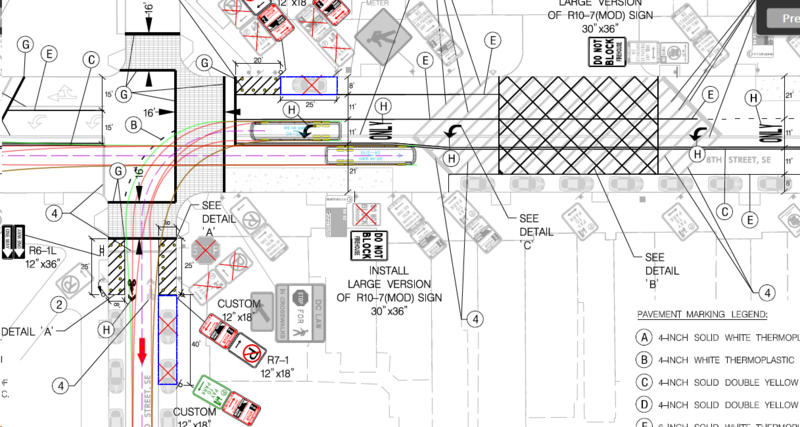 In our SMD, I requested back racks where room exists along Pennsylvania Avenue, near the CVS at 12th/Pennsylvania Ave SE, and at 14th/E and 14th/D. We neglected to vote on this so the list will come back to the committee next month. Beginning a long conversion, I presented to the committee an idea to reconfigure the 1300 block of E Street to the first 40-foot wide two on-street bike lane street in the city. The committee was generally positive to the idea but concerned about commercial traffic to/from Safeway and the number of turns into the alleys for parking in the new residential development. I will post in the near future more details including meeting dates and a general timeline. (Copied from committee report) Beth Purcell represented Capitol Hill Restoration Society, the applicant of the landmark nomination. Ms. Purcell presented on the history of the building including tracing the history beginning with the Boston Public Library through the Carnegie Foundation to Southeast Library. The committee provided a list of questions in advance and Ms. Purcell provided detailed written answers (attached) as well. After a discussion about the role owners play in landmark designations, the committee recommended unanimously the ANC support this application on consent, but will be looking forward to letters of support from the Department of General Services, DC Public Library, and Friends of Southeast Library. 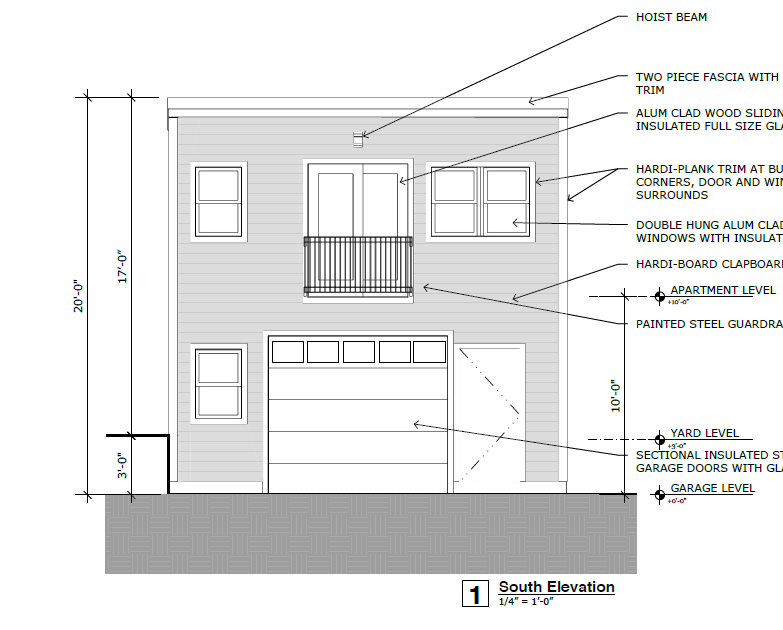 (Copied from committee reports) Applicant presented the plans for a 13-foot rear addition, the last three feet being the amount that triggered the need for special exception. Earlier this year, the committee received a letter of opposition and motion was filed with BZA for party status in opposition from an adjoining neighbor for an earlier iteration of plans. After discussions with the neighbor, including exploring a third-floor addition, an agreement was reached for the 13-foot addition and the opposition dropped. The applicant indicated the other adjoining neighbor supports the project but hasn’t provided a letter. The Committee voted unanimously to support the application. *The architect for 1322 D Street SE indicated that her clients were eager to reach agreement with the opposing neighbors because the Office of Zoning is taking sometimes up to 18 months to issue full orders with a party in opposition. I agreed to pull data from the office of zoning website and look into this and create testimony for performance oversight of the Office of Zoning. I will post a longer item about this closer to the oversight date, February 28. *I broached the subject of conservation districts. Again, this is the last of a long discussion that I will be having with affected SMDs, OP, architects, preservationists, YIMBYs, developers, and all other affected parties. See Capitol Hill Corner’s Overview here. This entry was posted in Uncategorized on February 11, 2019 by corey. Phew, what a night. In many ways, I feel ANC 6B was lucky to host a community meeting between our neighbors and MPD regarding the stop-and-first incident of three children in December. Recognizing my place in this system, I ceded any role in this conversation to those whose lived experiences trump mine. ANC 6B did not hold an alcoholic beverage committee meeting this month, hearing the only case (ABRA-096910) to extend Sunday patio hours for Little Pearl to 11:30. I voted on this case knowing it could be compared to our negotiations with patio hours for the 1401 Pennsylvania Ave/Neighborhood Restaurant Group project. I didn’t vote lightly on this. In the end, the patio’s location towards Pennsylvania Ave and the immediately adjacent neighbors presenting no opposition, I voted to amend the settlement agreement and support a stipluated license to extend Little Pearl’s patio hours to 11:30 on Sundays. There were three planning and zoning committee items on the full agenda. I voted to support the HPA applications for 628 A St SE (HPA #19-079) and 302 South Carolina Ave SE (HPA #19-140) as detailed in my committee post. 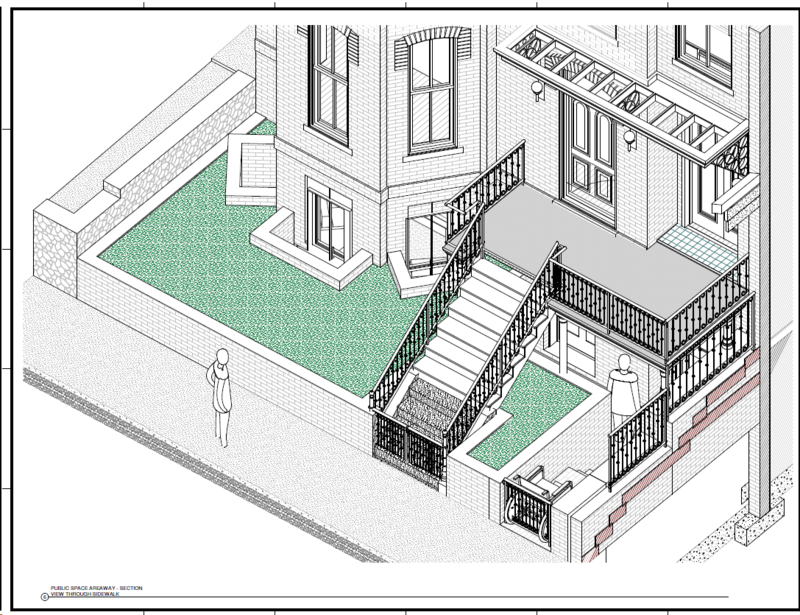 121 7th Street SE came to the full meeting with a new design. As detailed in the committee post, no amount of work will change the fact that the building is ugly (though less ugly than at committee). However, it’s clear the building is consistent with the preservation law and regulations. 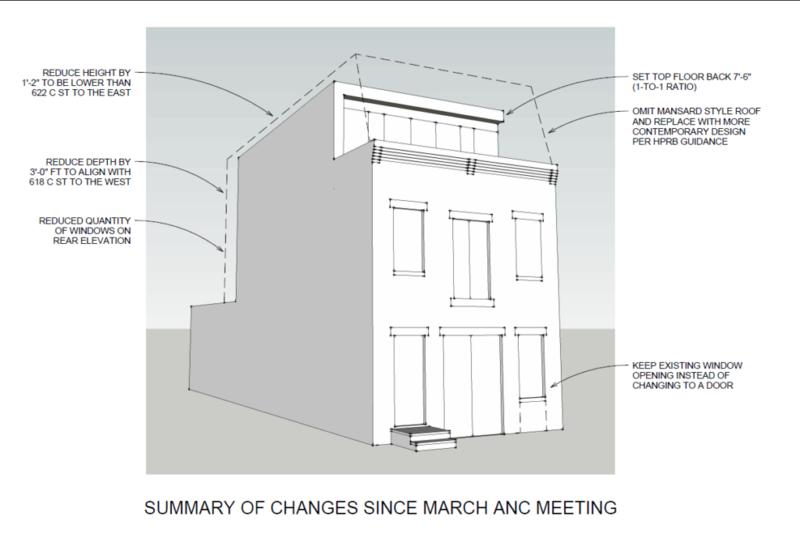 The ANC voted 6-4 to oppose the application on narrow grounds of front and rear fenestration. I think in the end, the motion could have been identical just changing a word from oppose to support. I voted against the motion to oppose because I believe the addition, while ugly and needing some fenestration changes, is consistent with preservation law. 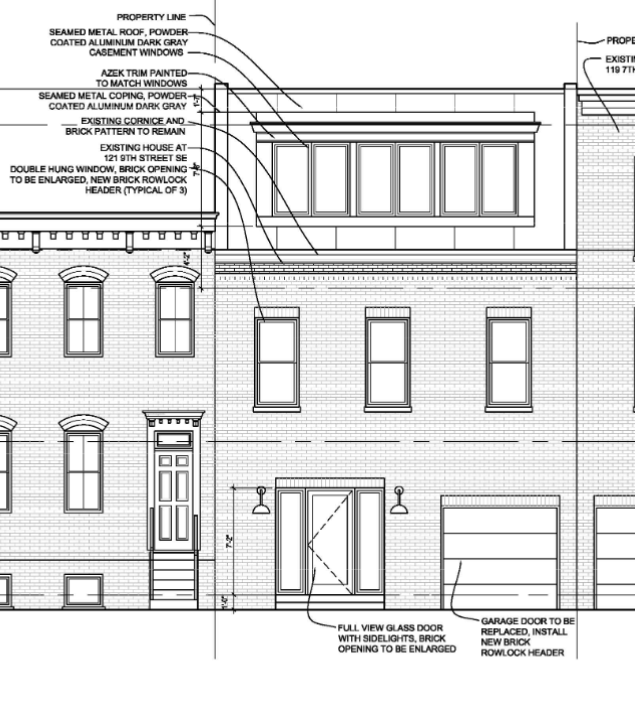 The latest iteration of 121 7th Street SE. No other votes of consequence were taken at the meeting. The new officers were unanimously elected and business votes related to budget matters were taken. This entry was posted in Uncategorized on January 17, 2019 by corey. My first meetings as commissioner! 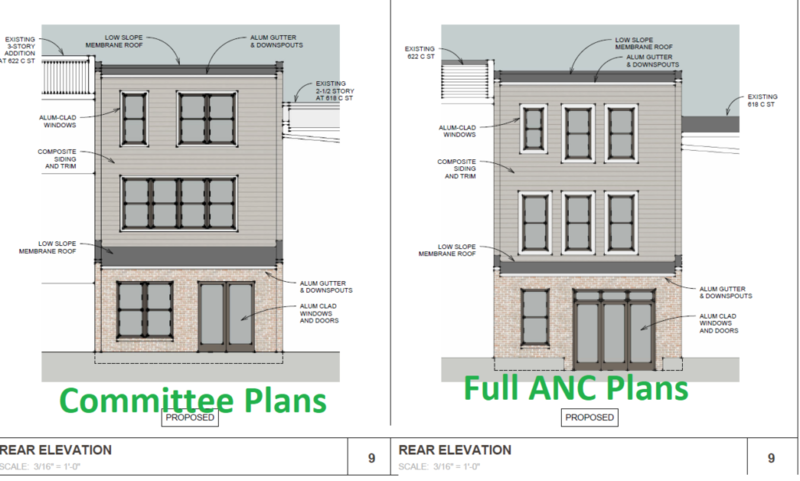 ANC 6B had four properties (and five items) on the planning and zoning agenda as well as four items on the agenda for the transportation committee. Let’s get to it. Nothing exciting here, a side addition to fill in a side yard, set back 25 feet back from the front facade. I voted to support and the resolution passed 10-1. Anything you do to this building won’t make it pretty, unless it’s getting rid of a the garage and curb cut. 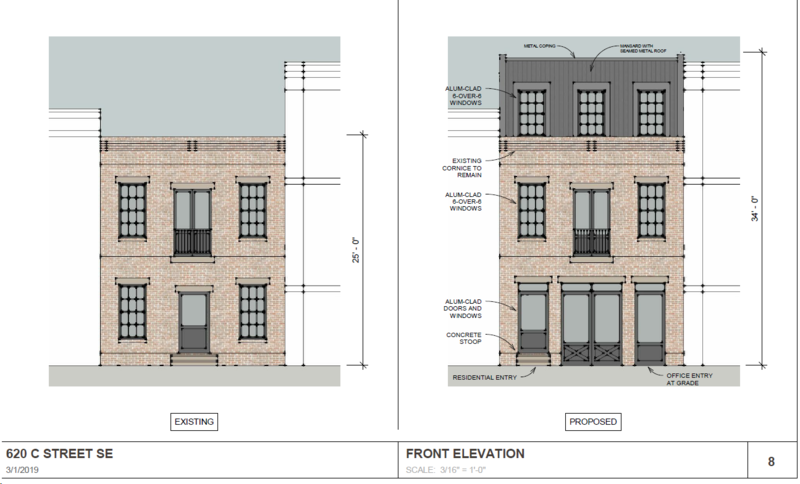 Historic Preservation: In this case, an applicant is proposing a large upper and rear addition to a non-contributing building. In my opinion, this building is ugly and will always be ugly as long as the curb cut and ground level garage are retained. No amount design will get around this problem. I voted to against a motion to oppose this project. The motion passed 6-4. I am unsure of my vote in the full ANC and will spend some time studying the existing preservation law. Why? Because applications for non-contributing building in historic districts are similar to what I would envision for conservation districts so I want to get this right and see what historic district-lite is like in practice. 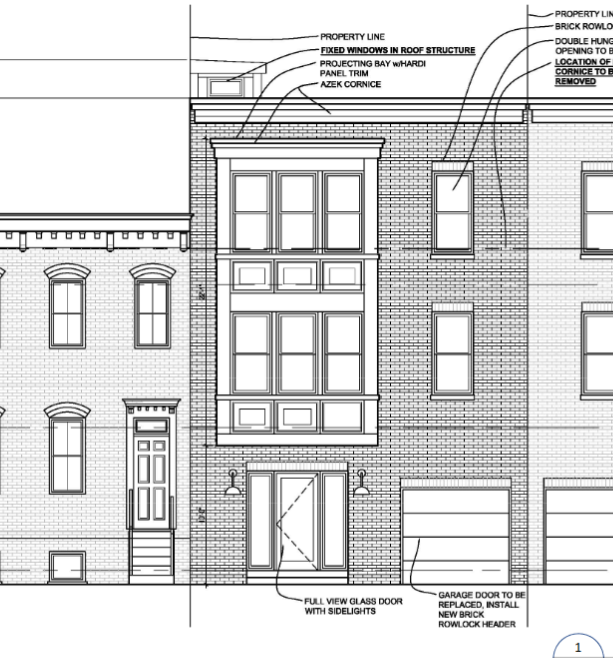 Zoning: We spent a fair amount of time on this and I was the only vote against a resolution of no stance on this case as I would have voted against this application for a special exception for cornice removal. 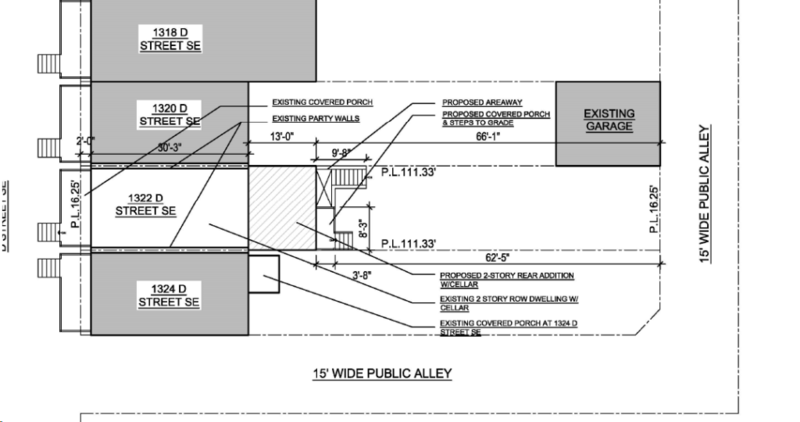 I felt the applicant didn’t do a good job explaining why a historic district property should get this relief while so many non-historic district properties have to set their upper additions 3-4 feet back. After doing some research earlier today, I came around to support the cornice removal special exception after figuring out the standard employed by OP and the BZA on removal of rooftop elements. In the end, it appears the BZA application will be pulled, but this zoning discussion was a great learning experience. A straight forward zoning variance case whose exceptional practical difficulty is an small lot (891 square feet). I voted in support and this case will be on consent. It may or may not come back to ANC for historic preservation review. Unfortunately this was supposed to have more information but turned into more of a catch-up session for new commissioners. Soon, DDOT will present final plans to reverse traffic on this stub of D Street and there will be a longer public meeting and discussion of this. Click here to see the last plans that were available, from mid 2018, showing the potential traffic and circulation flow around these blocks. 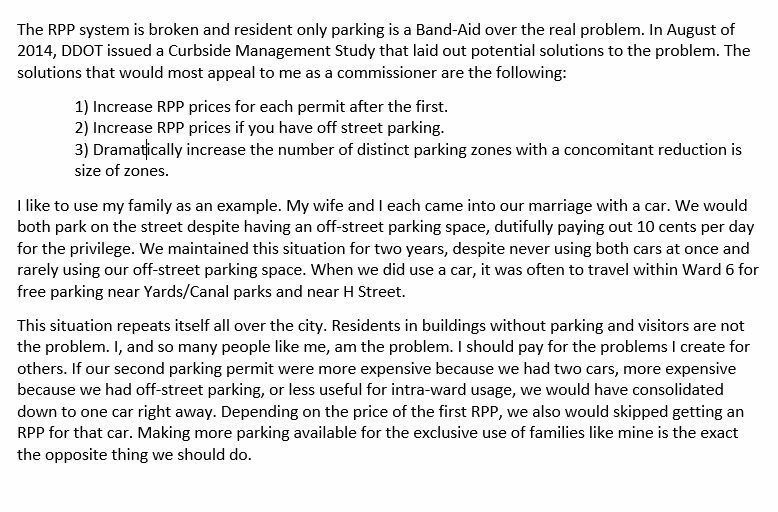 As the rulemaking expanding the regulatory authority for RPP-only parking winds its way through the bureaucratic morass, ANC 6B is leading the way on understanding the implications and seeking consensus from constituents to move forward. DDOT Presented on the process and indicated the final rulemaking will mostly match the proposed rulemaking. For SMD 6B06, I am not ready to move forward with a request and instead will reach out to residents on all blocks to gauge interest. To be quite frank, I’m disappointed in these rules and think it papers over the actual problems with residential parking. Passing the onus from DDOT to ANC commissioners is abdicating responsibility for effective curbside management. Those who best know DC Municipal Regulations should not get their way; DDOT should proactively promote responsible regulation. At no point in this presentation did we discuss whether we should make RPP only blocks, just how to do it. I outlined my views on RPP in my candidate statement to Greater Greater Washington on RPP, which details more of my issues with the current regime. For a committee that is gung ho for Mayor Bowser’s tepid steps into Vision Zero, it was not a surprise ANC 6B’s Transportation Committee unanimously voted to support with these proposals. As I mentioned on Twitter, I sought out to to get support for bike racks on-street in every commercial block in ANC 6B. When it was obvious there wasn’t the appetite for such a move, as it would take away parking and require a formal Notice of Intent process, I backed off. We ended up deciding to compile a list of more locations for standard bike racks (in the “furniture” zone between the sidewalk and curb). I believe much of the low hanging fruit has been picked by DDOT and the Capitol Hill BID so this list won’t be very long. When we get more dockless bikes with lock-to requirements, I have a feeling we will quickly be revisiting this. That’s it for committee meetings this month. Please join us at the Hill Center on Tuesday, January 15 for our first ANC meeting of the year. MPD will be there to address the incident at Frager’s last month. This entry was posted in Uncategorized on January 10, 2019 by corey. 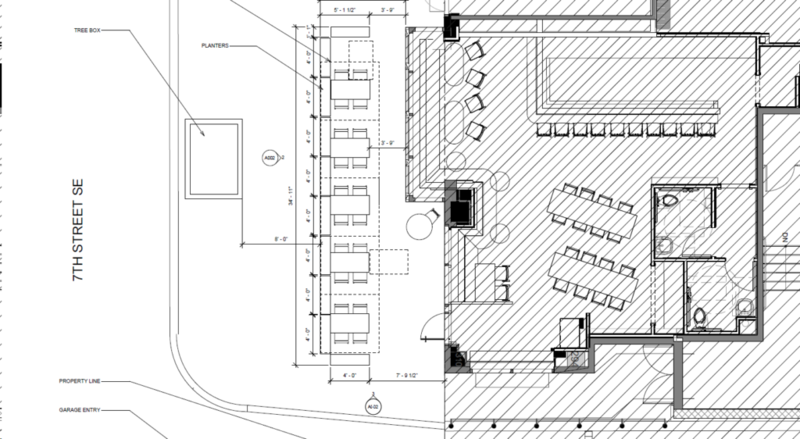 The new food hall/restaurant/bar at 1401 Pennsylvania Ave SE from NRG should open this summer. While I feel that the building and bar is a huge net plus to the neighborhood, patio hours on the 14th Street side of the building are already proving contentious. The patio would be across the street from a residential mental health care facility as well as two row houses. Appropriate hours of use of the patio will be different in this context than if it were facing Pennsylvania Ave or another commercial block. The MoveDC plan presented an ambitious future for the District to vastly increase non-automotive mode share. Taking them up on their plan, ANC 6B initiated step one of this long-term process getting DDOT to include the lanes in the long range plan for the Metropolitan Washington Coalition of Governments. The next steps will be concept designs and a long vigorous outreach program to the commercial property owners and operators along Pennsylvania Ave. By the end of 2019, I hope those concepts are publicly available and the dialogue of getting buy in starts. 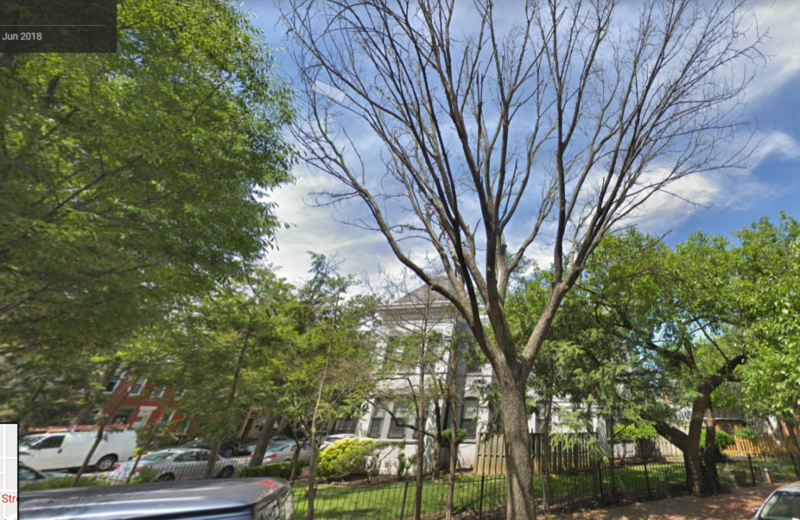 Most of ANC 6B06 is adjacent to the Capitol Hill Historic District and some historic preservation groups have argued for Hill East to either be part of an expanded historic district or a new separate historic district. I firmly believe this is is the wrong process for our neighborhood. Through the next year, I will continue to reach other to preservation advocates, elected officials, and administration officials to push for Hill East to be the city’s first conversation district. Often referred to as historic district-lite, conservation districts will allow for design review, development standards, and other positive aspects of preservation without requiring rigid adherence to subjective standards or limiting development potential. By the end of 2019, I hope to have an ANC-led working group on establishing a conservation district for Hill East, working collaboratively with the preservation AND development communities. Add named alleys to the Residential Parking Permit (RPP) system or otherwise allow alley residents to get residential and visitor parking permits. Our neighbors who live in alley dwellings shouldn’t be treated as a separate class when it comes to allocating public curb space. in 2019, DDOT should issue a final environmental assessment on Southeast Boulevard and Barney Circle redesign. This is a project that is very important to the city and should be a huge win for our neighborhood. This year should be limited to the Environmental Assessment and comments on the proposals. This year, I hope to see this project fully funded in FY20 and construction starting by the end of the year. Data on 311 requests and resolution is publicly available. As we move forward throughout the year, I will focus on portions of the 311 request backlog and try to get some of the long standing issues finally resolved. 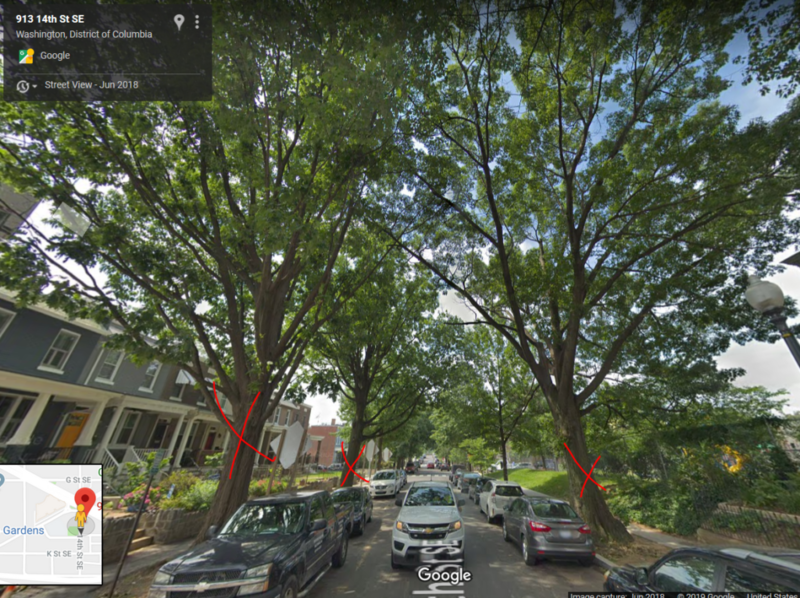 This entry was posted in Announcements and tagged 311, Affordable Housing, bike lanes, Conservation Districts, DDOT, Open Data, Penn/Potomac, southeast boulevard on January 2, 2019 by corey.